“From the medical and scientific point of view we have this great physiological fact before us, that the first thing alcohol does in 99 cases out of 100 is to affect the mental working of the brain of the man who imbibes.”—Dr. Clouston. “ Alcohol is not a stimulant but a sedative as was long ago pointed out by Sir Samuel Wilks.”—Sir Jas. Barr, M.D. “ Alcohol diminishes the rapidity of thought, makes the imagination and power of reflection commonplace and deprived of originality, acts upon fine and complex sensations by transforming them into coarse and elementary ones ; provokes outbursts of evil passions and dispositions, and in this way predisposes men to strife and crime, and upsets habits of work and perseverance.”—Prof. Sikovsky, St. Petersburg. Société Russe pour la protection de la santé publique—Commission d'alcoolisme (1898-1900). The intricate guiding and controlling mechanism by which all our bodily functions are regulated and maintained in action is called the nervous system. It is the machinery of our thoughts, our emotions, our memory; it directs the move­ ment, voluntary and involuntary, of every muscle ; it controls the secretion of all our glands, and governs, in fact, every function of the body. When the whole body is starved, the nervous system is the only part which at first does not lose weight; in fact, it lives on the other tissues and at their expense. Its influence cannot, therefore, be overestimated, and it is imperative that every one should possess sufficient knowledge to realise both the importance and, at the same time, the structural delicacy of this part of our body, in order to save it as far as possible from wrong and reckless treatment. The effect of alcohol on the various parts of the nervous system can only be correctly estimated when the general correlation of these different parts is understood. We must, therefore, preface our discussion of the main issue with a short sketch of the nervous system and its functions. consisting of (a) Large Brain or Cerebrum, (b) Small Brain or Cerebellum. II. The Spinal Cord. III. The Nerves, including the sympathetic nerves. 50 ALCOHOL AND THE HUMAN BODY chap. protoplasm, in the form of minute nerve-cells and nerve-fibres embedded in a supporting tissue or framework. An anatomical study of the nervous system must consequently embrace (A) that which is visible to the naked eye, and (B) the cells and fibres which require a microscope for their demonstration. The main relations of the different parts of the nervous system to one another are well shown in Professor Fraser’s photograph (Fig. 8) of the head and neck, in which the outer part of the skull and the left half of the lower jaw has been removed, showing the large and the small brain covered with their vascular membranes and with the spinal cord leading thence downwards. From the spinal cord some of the larger spinal nerves may be seen running out into the neck, and from thence into the upper limb. 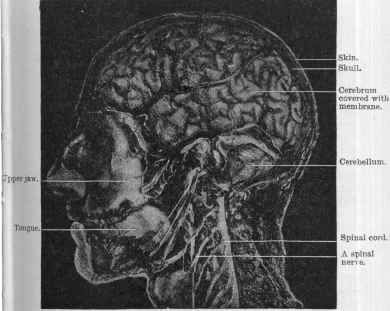 The brain1 is the dominant organ of the whole body, for not only are all our mental powers dependent on its healthy activity, but even such vital functions of organic life, as the beating of the heart and the movements of the chest to maintain breathing — functions on which life itself entirely depends—are sustained by the activity of the brain and spinal cord. Only when the brain is intact are the processes of thinking, feeling, and willing possible ; only when the brain is well nourished and free from poisons can these processes be accomplished in perfection. The brain not only evokes energy in all parts of the body, but it also controls bodily functions and activities so as to enable the organs to do their work efficiently. In order to carry on successfully this all-important duty of governing or controlling the body, it is obviously essential that the brain should be kept free from anything in the shape of depressing influences, which would hamper its power of co-ordination and determination. Many narcotic drugs, un­ fortunately, exert this hampering effect. 1 I.e. large brain (cerebrum) and small brain (cerebellum) together, see Fig. 8. More than this, it is a matter of supreme importance to every human being that he or she should enter the world with a normal and healthy nervous system; in fact, it ought to be regarded as a national duty to secure for every unborn child a vigorous brain—balanced in its powers, and possessing the potentialities of well-regulated mental action. At present, much time and energy is devoted to improving the poor mental material of backward children by educational means, but it would be more scientific if we studied diligently the ways and means of creating sound nerve structure at the very start of life, seeing that no amount of subsequent educa­ tion can make perfect a brain that comes into the world weak in vitality, and with its parts miserably endowed as to their ultimate power of development. 52 ALCOHOL AND THE HUMAN BODY chap. The growth of the brain continues for thirty years, during which time it is particularly sensitive to the influence of drugs, to over­strain, and to lack of proper food. From the earliest stages of infancy the factors that ensure the steady and healthy development of a child’s nervous system ought to be recognised, in order that a good result may be finally attained in the shape of a self-controlled and reliable personality. 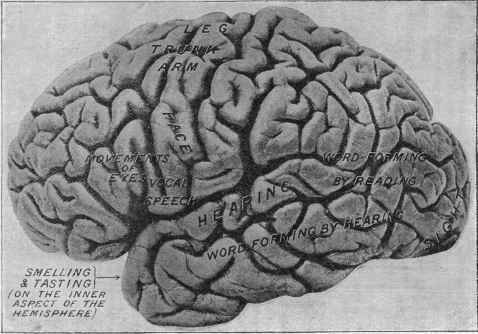 Now two plain physiological facts require emphasis here— first, that there is a profound connection between the structure of the brain and the mental characteristics displayed by a human being ; and, secondly, that even the most moderate approach to complete perfection of structure can only be expected if suitable and sufficient nourishment and suitable and rational training be supplied during childhood. In the case of children robbed of sleep, plied with wrong food, and never protected from alcohol and tobacco—their growth and development, instead of proceeding at the normal and rapid rate, proceed but slowly, and indeed become progressively slower as the years go by. School education will be of little avail to counteract the deterioration of a nation, if no means be taken to prevent that insidious undermining of the vigour of its future citizens, which is constantly taking place through ignorance and wrong treatment of the nervous system in child­ hood and youth. The brain (cerebrum and cerebellum) is situated inside the hard bony case known as the skull, which in the adult is strong enough to protect it from all ordinary damage. The skull is lined with one kind of membrane (dura mater), while another much thinner membrane (pia mater, Fig. 8), consisting of a close network of blood-vessels, covers the brain, lying in close contact with all its folds, and sending branches of arteries and veins into all its parts. Through these minute vessels a very large blood-supply is accorded to the brain, this supply being obviously adapted to keeping the delicate nerve tissues steadily provided with the nourishment that is essential for their vitality, and for the evolution of the stream of energy which is constantly rising from the nerve centres. The convoluted surface (Fig. 9) (often called the cortex, Lat. = bark) of the cerebrum, or great brain, is composed of masses of minute bodies called nerve corpuscles (Fig. 16, No. 1, p. 126), which are grouped together in definite areas or “ centres,” as they have been usefully termed, and have the two functions of (1) receiving and recording the sensations which are constantly coming in from our sense-organs, the eye, the nose, the ear, the skin, the muscles, etc., and (2) issuing or sending out impulses to the muscles for the production of movement. Let us now discuss the arrangement whereby the outer surface of the brain provides for the performance of these different acts of our conscious and intellectual life. During the last thirty years, since the epoch-making discoveries of Hitzig, Fritsch, and Ferrier, we have learnt from experiments on animals that a large portion of the brain surface is divided into compartments or areas for different duties (“sensori-receptive areas ” and “ sensori-motor areas ”)—while the remain­ ing areas, the functions of which are as yet undetermined, are provisionally spoken of as “ association areas,” because they are undoubtedly linked together with other regions by connect­ ing fibres. As all thought, emotion, and volition depend wholly on our sensory impressions, and as there is no consciousness unless the senses are in activity, we will begin with a brief survey of those regions of the great brain which receive sensations. (a) Sight.—The pictures transmitted by the nerves of sight from the eyeballs are carried to the hinder or occipital part of the brain, to the area marked “ sight ” in Fig. 9. (b) Hearing.—The impressions of sound are received and registered in the upper and outer part of the temporal lobe marked “ hearing ” in Fig. 9. (c) Smell and Taste.—These two senses, which are but feebly developed in man, are also recorded in the temporal lobe on its inner aspect. nerve organs in the skin when touched, or heated, or cooled, or pricked, is in part registered in the sensori-motor (vide infra) region of the parietal lobe, but the sense of touch is also recorded in other parts of the cortex, or surface, of the great brain. In like manner, the records of our movements and delicate sense impressions of tension and pressure coming from the muscles and moving joints are registered in the sensori-motor region. (e) Space.—Our judgment of our position in space, and especially our consciousness of balance and accuracy of posture, is founded on special spatial sense impressions which are localised in the temporal lobe, probably in the region just below the word “ hearing ” in Fig. 9. For our consciousness as a whole we depend on the information we obtain when those portions of the brain which record sensation are all in a normal state of activity,—and it is of the utmost importance that this normal activity should be maintained in the highest degree of efficiency when we are awake and at work. Now such activity depends upon the sensitiveness of thousands of the most highly developed brain corpuscles (shown in Fig. 11, p. 60) which compose the sensori-receptive centres, a sensitiveness which is essential if correct impressions from the external world are to be truly recorded. It is obvious that when the smallest doses of drugs are capable of affecting protoplasm chemically, they can hardly fail to affect the sensitive delicacy of those corpuscles. We have seen that the brain centres or stations for re­ ceiving sensations from our eyes, ears, etc., occupy, roughly speaking, the hinder and lower part of the cerebrum, and we must now turn to the middle region where are arranged the centres or stations for the issuing of orders to the muscles for the execution of movements. This is the all-important sensori-motor region. Fig. 9.—Copy of a photograph, by Prof. Retzius, of the left half of the human cerebrum, or great brain. The areas indicated by the words written on the photograph serve the functions and parts of the body stated. Thus the word “leg ” means that that spot is the centre for movements of the leg. 56 ALCOHOL AND THE HUMAN BODY chap. “motor centres,’’ but it is to be remembered that the same areas or centres are places where the memory of movements, of touches and muscular strains are recorded. They are there­ fore not only stations for sending out impulses to the muscles, but are also offices for receiving impressions. In passing, we may perhaps restate the well ­known fact that every nerve centre has of necessity a receiving or sensory part and an outgoing or motor part. The centres are definitely arranged in the brain, as shown in the figure. Thus, beginning above and passing downwards, are found centres for the leg, the arm, and the face respectively. If any of these parts on the surface of the brain are irritated by disease, e.g. by a tumour, or by drugs such as alcohol, absinthe, etc., convulsive move­ ments of the corresponding part of the body are liable to occur. Now the complete function of these motor centres is only acquired gradually and by training during the years of develop­ ment and growth, for at the beginning of a child’s life the centres which control its muscles are not structurally ready for use, and probably only attain complete maturity of action when adult life is fully reached. Take, for example, the centre for the muscles controlling the lips and tongue, the focus of which is situated at the point marked “ vocal speech ” in Fig. 9. Slowly, by a long and painstaking process of imitating and failing and trying again, the child’s nerve control over these becomes gradually established, words being spoken more clearly and more rapidly as time goes on. Thus the great faculty of speech is acquired. So, too, in the case of the centre for the leg muscles, a year or even two must elapse before the child gains sufficient “ control ” over them to enable him to walk across the floor at will. The explanation of this is, that as the nerve-cells in the centres guiding the legs increase in number and in the com­ plexity of their associations, and as the fibres leading from the brain centre to the muscles obtain their insulating sheaths and the whole apparatus becomes structurally more complete, the movements of the legs, from being unsteady and erratic, become more and more controlled until the habit of working together is established between the cells which guide the many different muscles involved. Between the sensori-motor area and the sensori-receptive centres there is a large area lying above the words “word-forming by reading ” in Fig. 9, concerning the function of which we are wholly ignorant, and a still larger mass, which constitutes the frontal lobe, which undoubtedly subserves the more complex intellectual operations of the brain. All mental functions, though possibly at one stage of their production formulated in the frontal region, are, nevertheless, the outcome of excitation of the brain as a whole. This is provided for by a rich system of association fibres and channels of communication, as shown diagrammatically in the accom­ panying Fig. 10.
control these completely is characteristic of early childhood, when the nerve centres are (as we have shown) in a primitive stage of development. Should, however, such a reversion to the inabilities of childhood take place in an adult, it means either that the cerebellum and allied centres are exhausted by illness or starvation, or that the nervous system is drugged. The great and little brain receive their information and give out their impulses by means of the spinal cord, which is continuous with both, and is composed of bundles of fibres and subordinate nerve centres for the muscles of the trunk and limbs. It gives off a series of nerves, each possessed of two roots, of which the front one is for outgoing or motor impulses, and the hinder one for incoming impressions and sensations. Hence every spinal nerve is composed of motor and sensory fibres bound together in the same sheath. The nerves are the cords or bundles of nerve fibres which run :—(1) from the skin and sense organs to the spinal cord and brain ; (2) from the brain and spinal cord to the muscles and to the organs, i.e. the lungs, liver, stomach, intestines, etc So small are these that a single fibre may be only 1/10000 of an inch broad. Those bundles of fibres and collections of nerve corpuscles which are distributed to the internal organs are commonly spoken of as the sympathetic system. Thus the whole body is associated together and brought under the influence of the nervous system, which on its part is affected by and receives impulses from every corner of the body. During the whole of life, the messages which come con­ stantly pouring into the brain by means of the nerves travel at the rate of 98 to 131 feet per second (i.e. about that of an average express train), the answers being conducted out again to the muscles with a like rapidity. Fig. 10.—Drawing of a dissection of the human brain in which the right half of the cerebrum (the right hemisphere) and a large piece of the right half of the cerebellum have been cut away. The spinal cord is seen entering below. 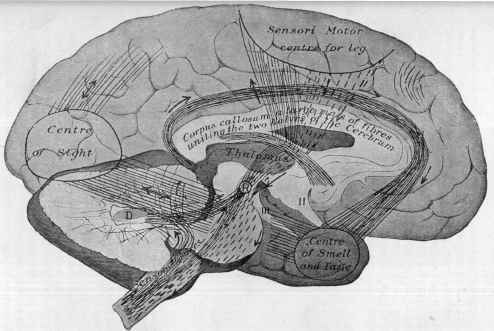 The diagram is designed to show the general course of some of the fibres that enter and leave the great brain, and which connect and thereby associate together the different sense areas or centres. The direction of the small arrows indicates the course which the nerve currents take. The continuous lines represent the ingoing and association paths, the dotted lines the outgoing or motor currents. The connections between the cerebrum and cerebellum are shown. From the grey dentate centre (marked D) in the cerebellum, fibres run up to a, centre marked R in the thalamus of the cerebral hemisphere. The spinal cord is also connected with the cerebellum. The figures II. and III. mark the second or optic nerve and the third nerve respectively. 60 ALCOHOL AND THE HUMAN BODY chap. The nerve corpuscles and fibres which make up the nervous system, i.e. the brain, spinal cord, and nerves, are all con­ structed on the same plan, though varying according to the function to be subserved. I. The Nerve Corpuscle.—We may take as normal specimens of nerve corpuscles one from a ganglion (see Fig. 17, a), and one from the spinal cord (see Fig. 11). Fig. 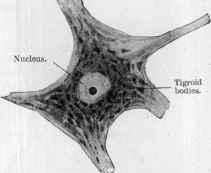 11.—Normal nerve corpuscle or cell, very highly magnified, showing its body substance, the darkly stained particles in which are termed tigroid bodies. Note also the large central nucleus. various methods. This having been done, we observe that the protoplasm is arranged in small, deeply staining masses called tigroid bodies (see Fig. 11), grouped around a central body called the nucleus (see Fig. 11). The body of the cell gives off numerous branches and one long fibre, which acquires an insulating sheath and then becomes a nerve fibre (Fig. 12) (vide infra). The larger nerve corpuscles are concerned with motor impulses, the smaller ones with sensory impressions. and their branches are well seen. II. The Nerve Fibre.—The nerve fibres throughout the body owe their origin to nerve corpuscles, which are (1) specially modified sense-appreci-ating corpuscles, or (2) nerve cor­ puscles in the brain, or spinal cord, or (3) little collections of corpuscles scattered about the body, known as ganglia. The nerve fibre essentially consists of a slender thread of protoplasm, which in many places, e.g. the brain and sympathetic system, possesses either no insulating sheath at all or an extremely thin one. Fig. 12.—Section of the cere­ bral cortex (Ramon y Cajal) stained with silver nitrate to show the processes of the nerve corpuscles. Fig. 13.—Normal nerve fibres moderately magnified. together, but here they have been slightly separated so as to show their individuality.